It is a critical issue to provide an automatic recogntion system with images of appropriate quality level. Our FXCAM Container 3-in-1 Camera was developed to meet all the requirements. To provide optimal conditions for taking an image, we suggest to use 2 external white LED illuminator devices with the FXCAM Container 3-in-1 Camera. The illuminator is built up of low power consumption LED's and works as a flash. Therefore, the power consumption is only about 10W while the light emission is 2000W. When the light flashes, the camera takes an image of the passing container's code, which will be transmitted through analogue video. The FXCAM Container 3-in-1 Camera includes a camera, a synchronizer unit connected to the illuminator(s)and auto iris optic, these were specially designed and optimised for identification applications. The effective range of the equipment depending on the environment (weather, sunlight, fog, etc.) conditions and the quality of the container code, it is about from 1.5 meters up to 3.5 meters. 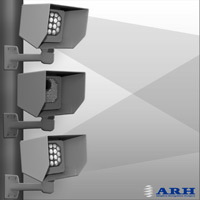 The FXCAM has primarily been designed for recognition applications (access control). However the FXCAM can be perfectly applied in many other applications where outstanding image quality is needed.